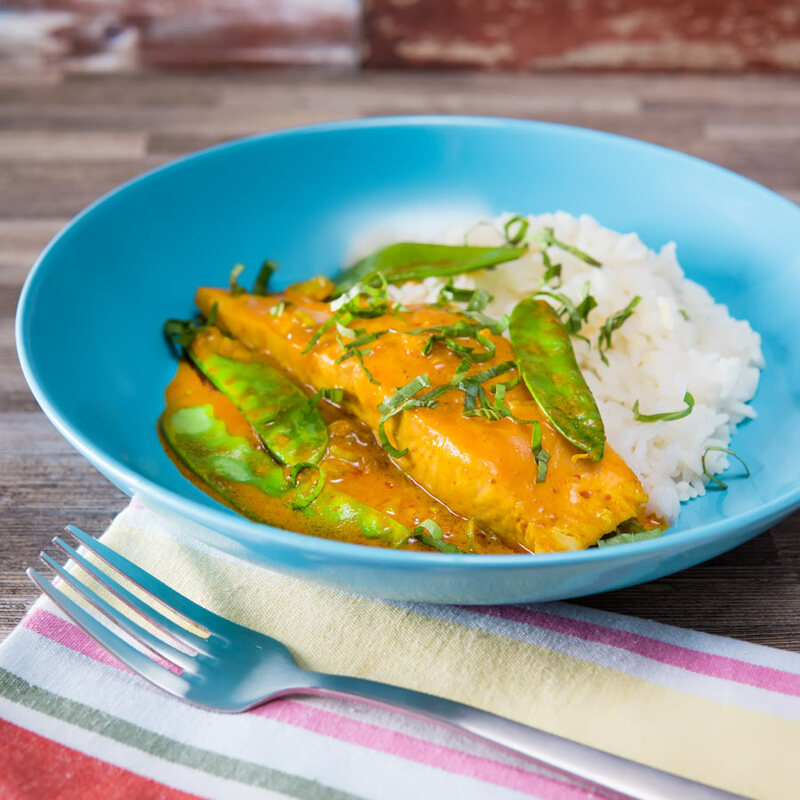 At 20 minutes from start to finish, this easy Thai salmon curry is a fantastic midweek dinner that even the most rushed of families can manage! I have no idea why there are no Fish Curry recipes on my site as yet and this easy salmon curry will probably open the floodgates. This recipe definitely falls into the curry in a hurry category! My timings say 20 minutes but in reality, once you are familiar with the recipe it is closer to 15. Most important it packs much more flavour than that short cooking time would indicate. The hot, sour, sweet and salty flavours closely associated with Thai food is really a great love of mine. I use them in everything from my Thai chicken salad through to my Thai Chicken Stir Fry. As with most of my recipes, this pays no nod to authenticity whatsoever. These are flavours I love with ingredients from my store cupboard! At the heart of this recipe is a Thai red curry paste, make sure you spend wisely. This is where the majority of your flavour comes from! How Do You Make Thai Red Curry Paste? 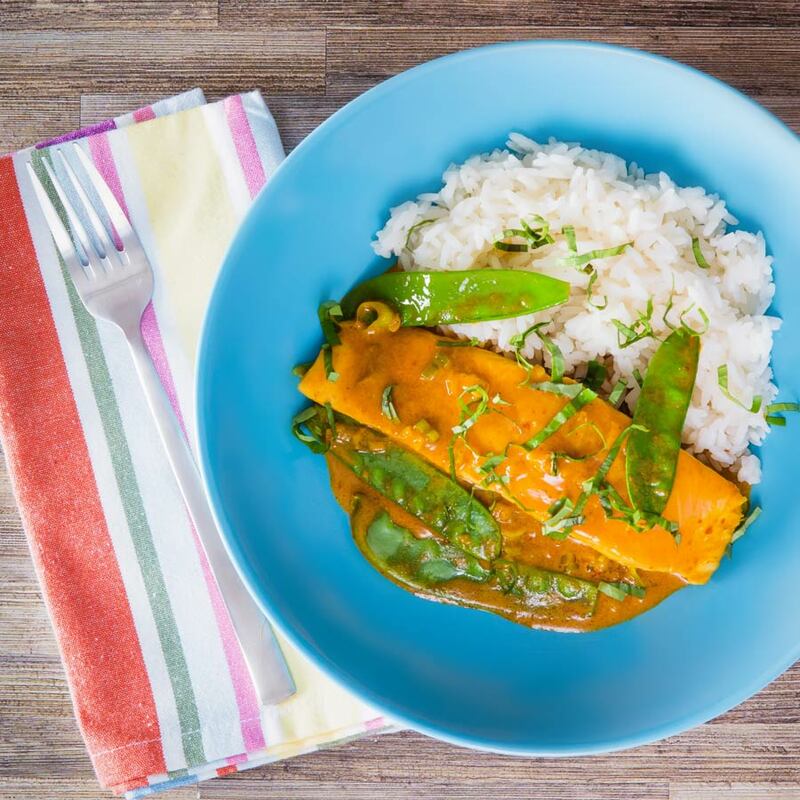 Now you can, of course, use a jar of Thai red curry paste for this Thai salmon curry recipe. In fact, I kind of assume that the majority of people will. But I am sure that there are a few of you out there like me… If you are intrigued making Thai Red Curry paste at home is really easy. I have a full recipe and methodology over in my Thai Duck Curry Recipe. But in essence, it is nothing more than a group of ingredients blitzed into a paste. The core of those ingredients are dried chili, lemongrass, shallot, garlic, ginger and if you can get it dried shrimp paste. Can you store Thai Red Curry Paste I hear you say! Well yes, of course with the caveat that it will not store as long as a store bought paste. Simple cover with oil and it will save for 2-3 weeks in the fridge. But if you freeze it then it will keep for a few months. As much as I love spending time in the kitchen sometimes quick dinners are a necessity! As far as I am concerned when I need a quick dinner I look no further than fish. Fresh fish fillets like this simple salmon curry recipe, my seared tuna steak or pan-fried cod with peas are all wonderful. They are all fridge to table in less than 30 minutes, but they do all require a bit of planning. If you have no time to plan then frozen shrimp offer a quick meal solution in the same amount of time and require little to no forethought. They are great in stir fries, but also make a great fish curry and also really brighten up a hot and sour soup! 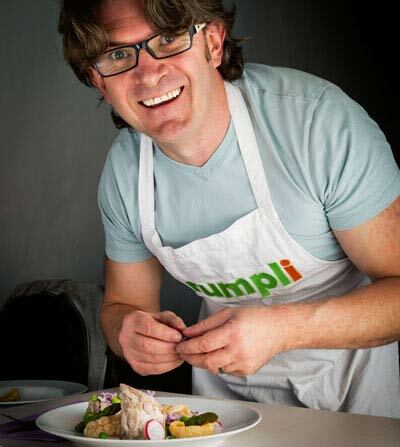 Then you can go the whole convenience hog and rock canned or smoked fish… Seriously these are great ingredients, whether in my smoked mackerel pasta recipe or canned mackerel fish cakes. Fish is a great addition to any diet and is seriously nowhere near as difficult to cook as most people think! 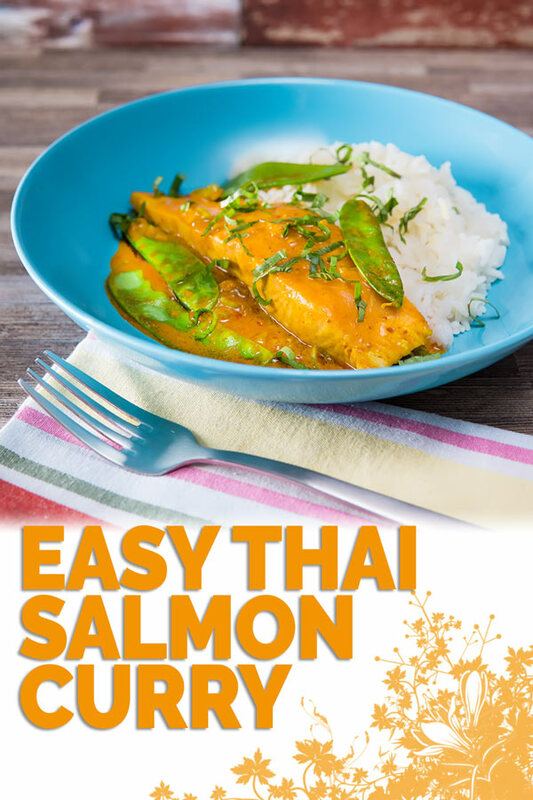 At 20 minutes from start to finish this easy Thai salmon curry is a fantastic midweek dinner that even the most rushed of families can manage! Finely slice your spring onions keeping the whit pőart separate from the green part. Heat a wok over a high heat and when hot add the oil followed by the white parts of the spring onion and then the Thai red curry paste. Stir fry for 60 seconds then pour in the coconut milk and add the fish sauce and brown sugar and stir to form a sauce. Reduce the heat to medium then add in your salmon fillets and cook for 3-4 minutes napping with the sauce occasionally. Add the green parts of the spring onion, lime juice and mangetout peas and cook for a further 3-4 minutes or until your salmon is cooked to your liking. Serve sprinkled with Thai Basil and a side of simply cooked Jasmine rice. This has my mouth watering. Nothing beats a good fish curry and this looks incredible. I haven’t had a salmon curry for far too long, might have to pop this on the meal plan soon! 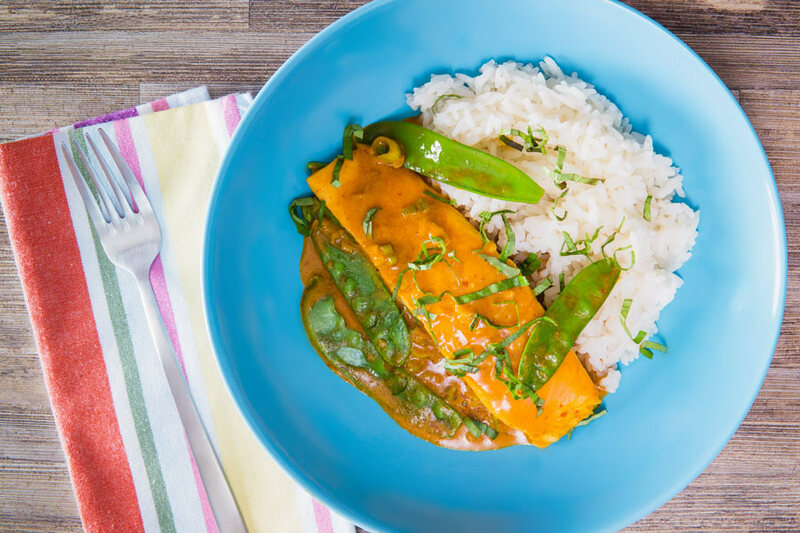 I am just so in love with thai red curry – it’s one of my favorite flavors! And I love that once you have the paste made, most recipes are pretty quick after that. 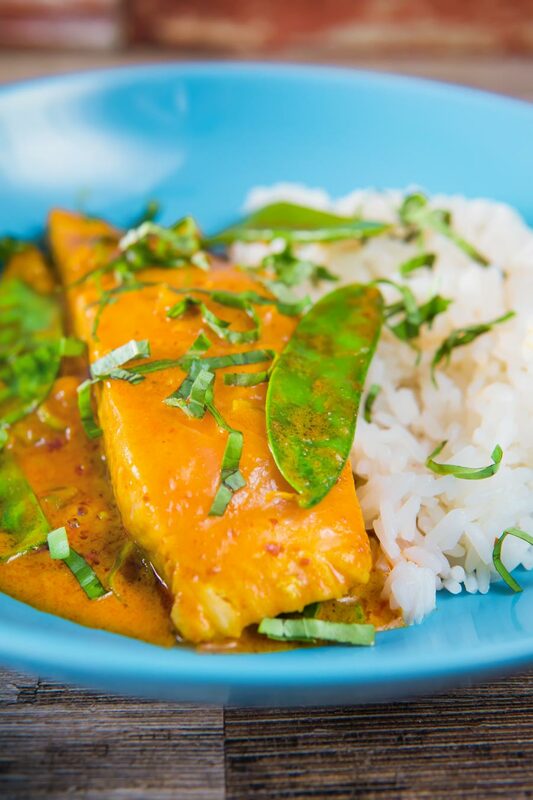 This salmon curry sounds delicious! It is great a bit of work in advance and then a whole world of quick tasty grub. This looks so tasty, I love quick and easy salmon dishes, perfect for a mid-week meal! Homemade curry is always so much nicer than making it from a jar of curry. It is really worth making a bit of effort.